Griffin Remedy Color Extend Conditioner contains antioxidant-rich Green Tea Extract to help neutralize free radicals. Organic Cranberry Seed Oil is used for its protective conditioning properties, while Organic Broccoli Seed Oil adds sheen without dulling residue. 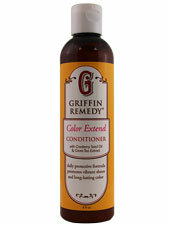 Griffin Remedy Color Extend Conditioner formula, protects color from fading, leaving hair moisturized, shiny and vibrant. Additional Info: Vegan. A Cruelty Free Company. Ingredients: Purified Water, Certified Organic Aloe Vera Juice, Coconut Wax, Corn Sugars, Coconut Fatty Acid Cream Base, MSM, Vitamin B5, Certified Organic Jojoba Oil, Green Tea Extract, Certified Organic Cranberry Seed Oil, Saw Palmetto Extract, Certified Organic Broccoli Seed Oil, Vegetable Glycerin, Green Tea Extract, Carrot Seed Oil, Certified Organic Chamomile Extract, Guar Gum, Orange Essential Oil Blend. Suggested Use: Massage conditioner through clean, damp hair. Leave on for 1-2 minutes, then rinse. For best results, start with Griffin Remedy Color Extend Shampoo.